WE’LL BE WAITING FOR YOU ALL THE YEAR ROUND ON OUR "SUNNY MOUNTAINS"! In winter time the shelter can be reached on foot (with normal mountaineering boots) following the forest path which gets groomed as cross-country skiing ring. Lovers of such discipline will enjoy three different tracks (all of them free) for both classic and sliding step, varying in length and difficulty. > Easy track: beginners ring, at Randuin (ten minutes from the parking). > Average track: from Serre Blanche to Montagne Seu (5,2 kilometers). > Difficult track: from Enfers to Montagne Seu (6 kilometers). Snowshoes lovers will find in us a useful departure point for several outings of varying difficulty. Among them the "Testa dell’Assietta" (2454 meters) and the "Monte Gran Costa" (2615 meters). The shelter can also prove handy for those who want to delight themselves in mountaineering-skiing since routes immersed in stunning landscapes depart from it. Trekking within the Gran Bosco Natural Park gives you a unique opportunity to enjoy the local flora and fauna. All sorts of rare and delicate flowers can be spotted along with stone pines and close encounters with many species of animals are most likely to happen: marmots, badgers, foxes, roe deer, chamois, deer, several kinds of woodpeckers, ravens, royal eagles, even wolves will be met eye to eye with just a little luck! The mountain landscape surrounding the site of the shelter also enshrouds plenty of historical and cultural landmarks from the past such as remarkable military strongholds and fine remains of typical alpine architecture. 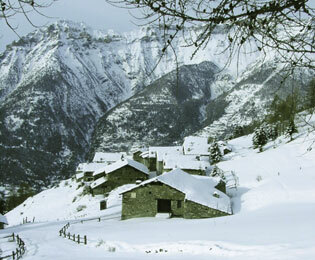 The Arlaud Shelter and the Alpine Guides co-operate in organizing several activities all the year round. Together with the Park Guards, it also organizes meetings available to the public on such topics as "The deer bell". Mountain bike lovers will find lots of tracks of varying difficulty within the boundaries of the Park: from the easy path Monfol/Arlaud shelter to the more challenging "Testa dell’Assietta". Much longer tracks, naturally designed for more-than-one-day outings, like the "Giro dei Forti" are also available. The local typical cuisine will be available to you in a gorgeous landscape: starters, sliced meat and salami, mountain cheese and… shelter specialities. Traditional polenta with meat, salted cod, melted cheese or deliciously matched with vegetables. Home-made cakes like apple-pies, Trieste Presnitz, Linz cakes, baked peeches. The list of red wines includes: Dolcetto, Barbera, Avanà. White wines are à la carte. The shelter has 16 beds (in dorm or in double room), 40 sitting places at the table inside and a summer patio. In dorm, half board: 42 euros (in the summer), 45 (in the winter). In dorm,full board: 55 euros (in the summer), 58 (in the winter). In the master bedroom, the cost of half board (including sheets and shower) is 120 Euros. 20% discount for children under 12 years old. Discounts for guides or accompanying of group leaders (minimum 15 people). We organize all-the year-round language courses, plein air oil painting lessons, host small groups self-managed seminars, set up music gigs, naturalistic meetings and... nearly everything you can think of. From Oulx (where either the State Road number 24 or the A32 Highway will take you) take the road which leads to Sauze d’Oulx. Before actually entering the town, turn left to Monfol. Once you get there you will have to park, leave the car and carry on along the forest path. 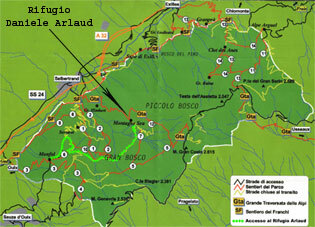 Be careful to follow the Rifugio Arlaud-Montagne Seu sign. It usually takes around 1 hour and 15 minutes – it’s an easy walk.